Monday Sophia and I starting collecting acorns for Ring a Day. When we find them, I put them in my purse. She has also been collecting them at school with her friends all week. She came home sick today with a fever though...so the acorns did not make it home with us. 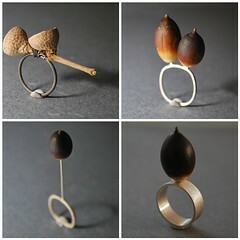 There will be more acorn rings to come...when we get the rest of them from school. I have a few more ideas of what to do with the acorns.